When the CD format was launched in 1982, EMI Music in Japan was known as Toshiba-EMI, as in Toshiba the electronics giant. For historical purposes, the label in Japan was founded in 1960 as Toshiba Musical Industries. In 1973, Capitol EMI bought a 50% stake in the company, and the name was changed to Toshiba EMI Limited. In 1982, Toshiba-EMI began releasing CDs in Japan. These early CDs are referred to as “black triangles” by collectors by virtue of the label design. Single-disc classical titles bearing the black-triangle design were released on the EMI label under the CC38 series. CC38 is the catalog number prefix for these CDs, and 38 referred to the retail price of ¥3800 (yen). Similarly, pop, rock, and jazz single-disc black-triangles were released by EMI in 1982 in the CP35 series, where 35 indicated the retail price of ¥3500. Catalog numbers for the initial CP35 series followed the form CP35-3XXX. A CP35-5XXX series bearing the black-triangle design followed. 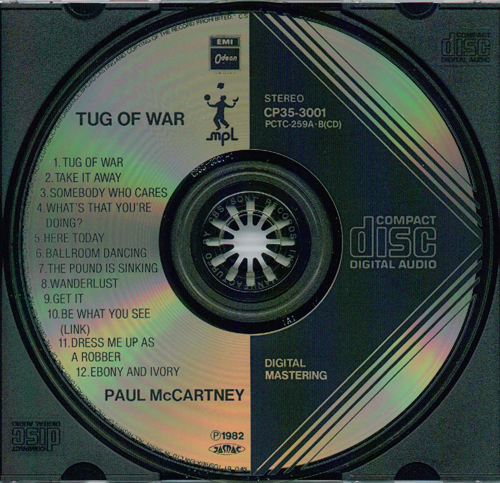 The first title in the CP35 series was Paul McCartney’s 1982 album Tug of War, which was released on the EMI/Odeon label under catalog number CP35-3001. Most Toshiba-EMI black-triangle CDs were pressed in Japan at the Toshiba-EMI plant, but the earliest titles were pressed in Japan by CBS/Sony. Here, we feature the early and very rare Japanese CBS/Sony pressing of Tug of War. 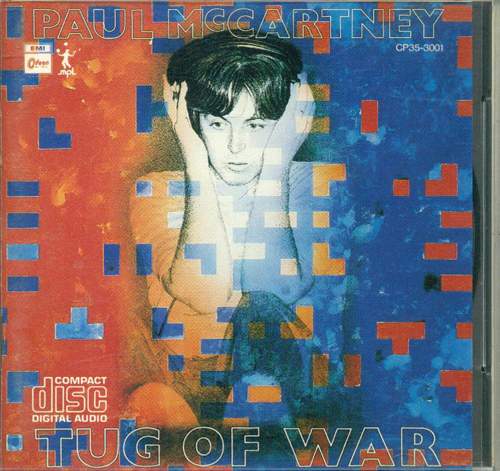 The CBS/Sony pressing of Tug of War shows the tell-tale signs of being an early pressing. The disc has “MANUFACTURED BY CBS/SONY RECORDS INC.” stamped on the plastic ring at the center. Also, the matrix code is stamped in the original CBS/Sony crude font. The matrix code is “CP35-3001-1 1A1”. Another indicator that this is an early pressing is the observation that this particular copy came in a smooth-edge jewel case with one long booklet retaining bar on the right side (see the picture of the album cover below). Jewel cases of this type were manufactured for a short period at the launch of the format and are rare. This jewel case has “Patent pending” embossed on the back. Although Tug of War was first pressed by CBS/Sony, Toshiba-EMI plant pressings followed and are more common. Shown below are the inserts and a spine label assocated with the CBS/Sony pressing of Tug of War, along with the black-triangle CD. The cover for the Japanese black-triangle CD of Paul McCartney Tug of War (EMI/Odeon, catalog number CP35-3001). Note that the catalog number is printed in the top right corner. The booklet is shown in the original jewel case. The single long booklet retaining bar to the right represents a rare, early jewel case design that was quickly replaced with the more conventional two shorter retaining bars. The back insert for the Japanese black-triangle CD of Paul McCartney Tug of War (EMI/Odeon, catalog number CP35-3001). 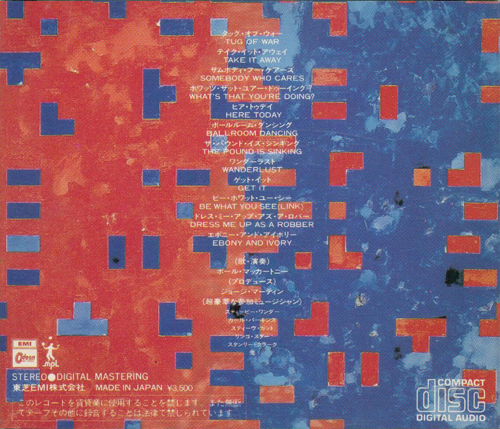 Back inserts for Toshiba-EMI black-triangle CDs were typically printed with much of the text in Japanese. Note that the retail price is shown as ¥3,500 in the bottom left corner. A spine label for the Japanese black-triangle CD of Paul McCartney Tug of War (EMI/Odeon, catalog number CP35-3001). The other spine label is printed in Japanese. The Japanese CBS/Sony pressing of Paul McCartney Tug of War bearing the black-triangle label design (EMI/Odeon, catalog number CP35-3001). “MANUFACTURED BY CBS/SONY RECORDS INC.” is stamped on the plastic ring at the center. The matrix code is “CP35-3001-1 1A1” and is stamped in the early CBS/Sony crude font.